“Sensitivity, sensitivity, I’m just loaded with that,” my daughter sang in the role of Queen Aggravain, a very insensitive ruler in her school’s production of Once Upon a Mattress. Today, the word is authenticity and who isn’t striving to be loaded with it? Be yourself. Be real. You be you. It’s been the thorn in the side of one presidential candidate and a spur for another. But this isn’t a blog about politics. It’s about people, all of us, and the authentic selves we’re supposed to tote along, wherever we go, all the time. Yet, like the good Queen Aggravain who at her most authentic self was a far, insincere cry from sensitive, how much do we really, truly value the real thing in the people we claim to know and love? Take my friend – let’s call her Susan because that’s her name and this, after all is a story about being authentic. Susan apologizes a lot. So much so that sometimes she says sorry for being sorry, especially when friends like me call her on her apology. “What do you have to be sorry for?” I’ve asked countless times. “No need to apologize.” I’ve reminded. “Stop saying sorry!” I’ve demanded. I am on constant apology watch having made curing Susan of this habit a personal mission. My intentions are good. I do this for Susan as part of my quest to help her and all the apology-prone women I know halt a pattern that weakens their words and undercuts their strength. I’m not the only one on this campaign trail. Ever since women started being viewed and castigated as unnecessary apologizers, a reformation movement led by women’s magazines, talk show hosts, parents, teachers and well meaning friends has been underway. But – and this but has taken me years and years to come to — what’s really wrong with those sorries? Is apologizing so terrible it must be cured by vigilant correction or are these corrections just another way to criticize? See, saying sorry is a part of Susan’s authentic, real self. She’s not doing it to appease me or you but because it is a part of who she is. She is, genuinely, a kind and thoughtful person who has taken on the responsibility to apologize for herself, for others and for the state of the world, as needed. That’s her being her. That’s her being authentic. And every single time I swoop in for the apology fix –no matter how helpful I intend to be –what I am really doing is judging, interrupting and critiquing. I am so busy catching the apologies, I miss the great things my smart, savvy friend has to say. Rather than listening, I am challenging Susan’s authenticity and revealing my own – as a fixer and judger. Not exactly the authentic self I want to tote along. So, here I am a self-proclaimed fan of authenticity realizing I’ve contributed to quashing it. I owe Susan an apology for being a critic of her apologies. Though she might just say sorry first. That’s her being authentic – and she’s genuinely loaded with that. Betsy Polk, co-president of The Mulberry Partners and co-author, Power through Partnership: How Women Lead Better Together, strives for authenticity in the life she lives and the work she does. 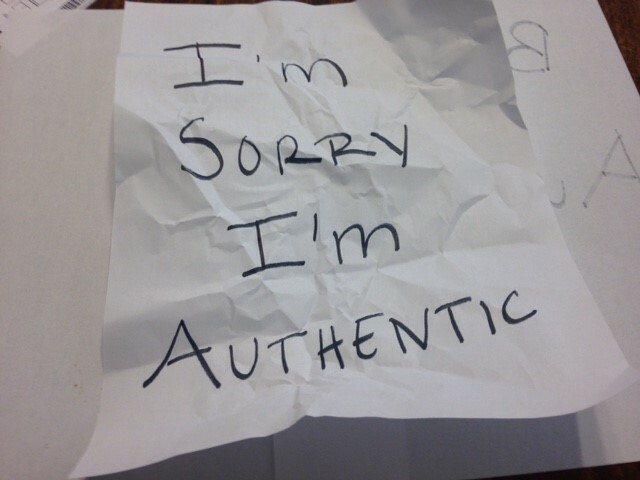 If you want to explore what it means to be authentically you without ever having to say you’re sorry (unless you want to), please contact Betsy at bp@themulberrypartners.com. She currently has room for two new coaching clients. PreviousPrevious post:Why making up is important in businessNextNext post:Korrin Bishop praises Power through Partnership in her “Sistership” post!